A strangely unbalanced hybrid with good battery life and plenty of processing power. Windows 8 and its emphasis on touchscreens has shaken up the laptop market, with hybrids and convertibles now as commonplace as ultrabooks and traditional notebooks. The Toshiba Satellite W30t-A-101 is the latest hybrid machine to arrive at the TechRadar Lab, and it uses an unusual design. Rather than using the kind of 180° hinge that Lenovo has employed on various Yoga devices or opt for a Sony-style sliding mechanism, Toshiba has gone down the detachable route: the screen can be attached to the base and used as a standard laptop, or removed entirely and function as a tablet. Toshiba has outfitted the W30t with an Intel Haswell Core i3 processor which comes with one of Intel's new integrated graphics cores, and there's also a 12.5in IPS display, 4GB of RAM, and a 500GB hard disk. 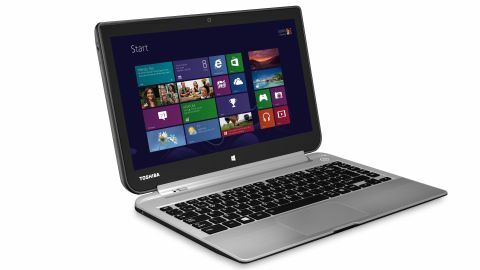 In an unusual move, Toshiba has crammed the components behind the screen, along with the W30t's primary battery – the base only houses the keyboard, some ports and a secondary power pack. No other machine mentioned here has this feature. If the model we've reviewed here is a little too expensive, then Toshiba has one other model available. It's the W30t-A-100, and it shares its screen and chassis with the system we've reviewed here. The big difference comes under the hood, where Toshiba has fitted AMD hardware. The A4-1200 is a modest mobile processor with two cores clocked to 1GHz, and it's got Radeon HD 8180 graphics. While that's enough to run Windows, it won't be able to match the Haswell hardware inside our review sample in either applications or games – but, on the plus side, its price is significantly cheaper. It's vital for any type of laptop to have a good screen, which is why Toshiba has installed an IPS panel inside the W30t. That's usually a guarantee of quality – almost all top laptops include this type of panel – but elsewhere the Toshiba's panel gives away the W30t's mid-range status. Its 1,366 x 768 resolution, for instance, matches the resolution of the Lenovo Yoga 11S and the Asus Transformer Book T100, but it can't compete with the pixels offered by the Full HD panels on the Sony VAIO Duo 13 and the Lenovo ThinkPad Yoga. Power is provided by Intel's Core i3-4020Y. It's designated as a mid-range chip, and it uses the latest Haswell architecture, but the 'Y' suffix is important – it means this is an ultra-low-power part. That means a modest clock speed of 1.5GHz, no Turbo Boost, and only two Hyper-Threaded cores. The integrated graphics chip has been cut back, too: rather than the HD Graphics 4600 GPU included on full-fat Haswell chips, the Toshiba's processor has HD Graphics 4200. Both cores have 20 stream processors, but the difference comes in clock speeds – HD Graphics 4600 hits a maximum of 1,350MHz, depending on the processor, but HD Graphics 4200 is reined in to 850MHz. It's not all bad news, though: this ultra-low-power part has a TDP of just 11.5W, which is the lowest of any Haswell chip – and should help ensure lengthy battery life. The rest of the specification matches up with our mid-range expectations, with 4GB of RAM and a 500GB hard disk. The latter component provides plenty of space, but other machines have more impressive storage: every other machine we've mentioned in this review has an SSD. The Toshiba's Intel-made wireless chip is dual-band, and there's Bluetooth 4.0, but there's no Gigabit Ethernet on-board or in an adapter. The port selection is found wanting elsewhere, too; there's only one USB 3 port, on the base. Elsewhere, there's a micro-USB port, microSD card slot, micro-HDMI connector and a headphone jack. It's all wrapped up inside a chassis that's finished with silver brushed aluminium and black plastic and, while the Toshiba looks good, it doesn't quite have the impact of the super-slim Sony VAIO Duo 13 or the bright orange Lenovo Yoga 11S. Part of that's because the Toshiba isn't quite as smart, but part of it comes down to the dimensions: the Satellite is 25mm thick and weighs 2.1kg. Sony's machine, meanwhile, is almost a kilo lighter and is 22mm thick, while the Lenovo Yoga 11S weighs in at 1.4kg and just 18mm.